Embattled Senator Dino Melaye (Kogi West) was yesterday arraigned before a Magistrate’s Court in Wuse Zone 2, Abuja, for allegedly jumping out of a police vehicle. He was accused, in a First Information Report (FIR), of destroying the side glass of a police vehicle and attempting to kill himself. He was also said to have resisted arrest. The FIR reads: “On the 24th of April 2018, about 1330hrs at Area One roundabout Abuja, within the jurisdiction of the court, you Senator Dino Melaye of the Federal Republic of Nigeria while being conveyed in a Police White Hilux Bus with Registration number NPF 3354 D to Lokoja, Kogi State, to be arraigned in court for conspiracy and unlawful possession of prohibited firearms in charge Number CMCL/14SC/2018 filed at the Chief Magistrate Court Lokoja, you Senator Dino Melaye intentionally broke the side windscreen of the bus and jumped out of the bus after it was blocked by a Hilux Vehicle with registration number Kaduna MKA 603 GY occupied by your younger brother Samuel Melaye and one Barrister Amefula David Emeka and driven by yet to be identified person who escaped from the scene after the blockade. “You Senator Dino Melaye after breaking the side windscreen attempted to kill yourself by jumping out of the bus and fell on the ground and thereafter started shouting that you want to kill yourself and implicate the police for your death. Dressed in a native attire, Melayewas brought to court in a police ambulance. The ambulance was marked: NPF2214D. He laid on the stretcher throughout the about one hour proceedings. He was brought to court under heavy security. Entry and exit into the court premises was restrained by the heavily armed riot policemen, numbering about 200. After Melaye’s plea, lead prosecuting lawyer, Alex Izinyon (SAN), sought date for trial. Defence lawyer, Nkem Okoro, prayed the court to hear his client bail application. Okoro argued that since his client was not charged with capital offence, he was entitled to bail. Iziyon objected to the bail application and urged the court to reject it. Ruling, Magistrate Mabel Segun-Bello noted that bail is now liberalised under ACJA. Mrs. Segun-Bello proceeded to grant Melaye bail at N90 million with two sureties in like sum. The magistrate said one of the sureties must be a civil servant not lower than Great Level 14, and that the other must have easily identifiable residence in Abuja. Mrs. Segun-Bello ordered that Melaye must deposit his international passport with the FCT Police Command. She ordered the defendant to report at the Wuse police command every working day of the week until same is altered by the court. The Nation reports that the magistrate adjourned to June 6. After the court’s proceedings, Melaye and his supporters remained in the courtroom for some hours, while his lawyer and others made frantic efforts to meet the bail condition. Notable faces at the court with Melaye were Senators Ben Bruce (PDP, Bayelsa) and Abiodun Olujimi (PDP, Ekiti). The entrance to the courtroom was secured by about 10 riot policemen armed with AK47 rifles. 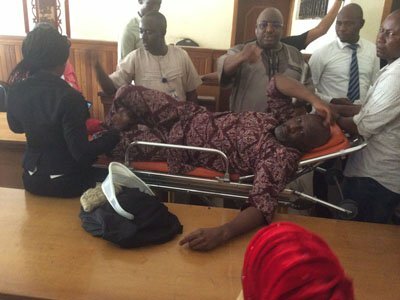 At about 4:20pm, Melaye was moved out of the courtroom, accompanied by the armed policemen, into the waiting ambulance. The vehicle was immediately driven away by a policeman, followed by a long convoy of police vehicles, with siren blaring.